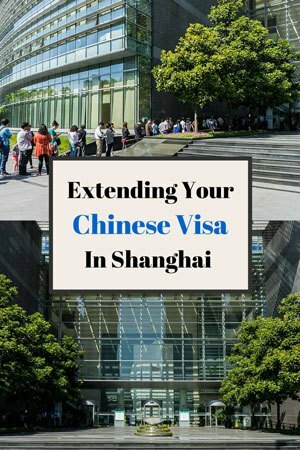 Everything you need to know to get a Chinese visa extension in Shanghai. There’s no denying it – China is a massive country. When we first made plans on moving from Vietnam, through China and onto Mongolia, we assumed we would only need a month. It was quickly apparent that we needed longer to explore more of what China had to offer. Before too long we had to make plans to extend our Chinese visa in Shanghai. With no knowledge of how to do this, we simply showed up in town and figured it out for ourselves. Luckily this was fairly easy to do, but there are some things we wished we had have known earlier. So here is our guide to extending your Chinese visa in Shanghai, without using an agency. Follow this sign once you exit the metro station towards the PSB. The first thing to know about extending your Chinese visa is that you need to start the application with at least seven days left on your original visa. The second thing to know is that once your visa is extended, the new dates start from the day you receive your new visa – NOT from the day your old visa was going to end. So don’t just extend your visa as soon as you enter the country. Best to wait until you are between 7 and 10 days out from your current one ending. Where Do I Extend My Chinese Visa In Shanghai? To extend your Chinese visa you need to go to the Public Security Bureau (PSB) office in Shanghai. The address is 1500 Minsheng Road (near Yingchun Road), Pudong New Area. To get there take the metro to Middle Yangao Road Station. Take exit 3, or follow the signs to the “Exit-Entry Administration Bureau”. Once you are out on the street, walk south and cross the big intersection. The PSB office is on your right, past the security gate. Walk to the left of the building and you will see the entrance. Follow these signs inside the metro station. This is the security gate outside the PSB. Walk through here and follow it to the right. The entrance to the PSB office in Shanghai. Extending your Chinese visa is pretty easy and there is no need to use an agent. One current passport photo (4×3 size). Photocopies of your passport information page and current Chinese visa. Completed application form (you can get this from the PSB). Registration Of Temporary Residence. This is a pink form you receive when you check in to a hotel or hostel that is licensed to host foreigners. This essentially proves that you are registered with the government to be staying wherever it is that you are staying.You need your pink form to be valid for the night of your application, NOT the night before. If like us you are staying with a friend or Couchsurfing, you will need to spend at least one night in a government-approved accommodation to receive this. Sorry, but that’s just how it goes. Need to book a night in an authorised accommodation to get your Registration of Temporary Residence? We recommend booking on either Hostel World or Booking.com. Proof of onward transport exiting the country. Proof of an itinerary for the next thirty days. Proof that you have not been working in China (a couple of old train tickets showing that you have been travelling, for example). Don’t have travel insurance? We recommend World Nomads for fast, cheap insurance. The temporary resident form you need from your accommodation (although your copy will be pink). Once you walk into the Shanghai PSB you will need to go to the third floor. Tell the person at the counter you are here for a visa extension and they will give you a number. Go to the back of the room and pick up a visa form. There are pens provided. Fill it out carefully and take a seat. When your number is called go up to the correct desk and say you are wishing to extend your Chinese visa. Hand over your paperwork and they will go over everything with you. Special Note – Here is where things got interesting for us – The first thing the lady said was, “We do not give visa extensions on tourist visas.” Shocked by this we pleaded that our friends had just picked up their own visa extensions the other day (this was not true), and that we just wanted to stay for another 30 days before going home. She then continued the discussion. She asked us for an itinerary to show what we were planning on doing in China if we were granted an extension. We said to her that hadn’t booked anything yet because we were waiting to see if we were given an extension first. She then said that all we needed to do was write out our proposed itinerary on a piece of paper that we could purchase from the photocopy stall at the back of the room. We scurried off, bought two pieces of paper (1RMB each) and wrote out a made up itinerary, ending with an imaginary flight to Australia. We returned to the lady and handed these in with the rest of our application papers. She told us to go to another window and speak to her supervisor. When we spoke to the supervisor she asked why we wanted to stay in China and what we were planning on doing. We told her exactly what was on our new itineraries and handed this over to her. Then she asked us where we had been China before Shanghai. When we started listing off the list of places she said, “I need proof”. I said we had some photos on our iPad, but luckily Lesh had a train ticket from Xi’an to Shanghai in her camera bag. She looked at it and seemed pleased. I think this is to prove that we weren’t working illegally in Shanghai. Next we were told to go down to the first floor and have a digital photograph taken. We went down, handed our passport over, had our picture taken (this is free) and were given our passports back with a paper slip and a code on it. We ran back upstairs and handed this in to the supervisor. You could probably do this when you first arrive to save running back and forth. Apparently happy that everything was in order, she walked with us back to the first lady and told her that we had been approved (we think this is what she said, as she spoke Chinese). A few minutes later the lady printed us off an official form with our digital photo on it, declaring that our passports were being kept at the PSB for the purpose of a visa extension, what our new visa dates were and what date we could pick up our passports. This new form is very important, and you will need to show this to buy train tickets, check into hotels, etc. The processing time was seven working days. I started to query this to see if we could pick it up any earlier but it seemed useless to ask. We did our application on the 21st of May and had to pick it up on the 2nd of June. Another interesting note is that we actually received an additional two days on top of our old visa, which was due to expire on the 28th of May. Instead our new visa was valid until the 30th of June. I assume this is because of the processing delay. Pick up your forms here. Returning to the PSB on the allotted date, we turned right when entering the building and stayed on the first floor. Next to the little café is the passport collection depot. Look for the “Charge And Collection” sign. The window on the right is to pay the extension fee and the window on the left is to pick up your passport. These are obvious once you are there. Hand in the form that was handed to you on the application day and pay the extension fee (160RMB). You will then be given a receipt. Go to the next window on the left and hand the receipt over and your other form. They will fetch your passport and return it to you. Before you leave the Public Security Bureau, DOUBLE CHECK YOUR PASSPORT! Any issues found must be fixed right then before you leave. Check the details, the dates, your name, your passport number, everything. Look for this sign on the first floor. The windows where you pick up your passport and new visa. If it is all in order, congratulations! You have just extended your Chinese visa! It is possible to extend your Chinese visa in any city that has a PSB office, and there are plenty of them. The process will be more or less the same, but the main benefit is that it will most likely not take as long to complete. We have heard of the time required to extend your Chinese visa in other cities can be as short as a couple of hours. Waited 2 hours and was denied. The lady said because I have travelled to China before I do not need to get an extension. I travelled to China last year but to a different city. There were rude and not willing to listen to my story. Hi Wes, oh no. So sorry to hear this. I am not too sure about visas in the past. When we went to extend our visa that we were on at the time, the lady told us no and they do not do this. We told her, we know you do and you can do it.. Our friend did it last week. She then gave us the form and we got it a week later. They were rude and very abrupt when we visited also. They did not seem to be very helpful at all unfortunately. Hi! Im a similar situation to you guys because I am staying at friends house and did not get a registration of temporary residence form. You mentioned you spent a night on a government licensed accommodation to get one, which I believe I will have to do too. However, I looked at the structure of the form and it mentions the arrival and departure date. Does de Public Security Bureau not find suspicious that you arrived on the hotel on the day of your application, and will leave of the following day, even though you are extending your visa for another 30 days? If yes, how exactly did you dodge that? Hi, I am currently in Chengdu, ending a first 30 days visa in China. I applied today at PSB in Chengdu, 7 days before expiration, I was accepted and given a date for picking my visa extension up, 9 days later. I gave the registration form from a registered hostel. BUT I was told by the officers that I CANNOT check out of this hotel until I am granted my extension. I didn’t know that, so I have already booked for a Yangtze River Cruise from Chongqing in between! I would not like to be in trouble with PSB!!! can i extend my visa more than once in China? because i just got 10 days visa L.
Hi, I also I would like to know if it is possible to extend your visa more than once time. Not too sure. Contact the immigration office. They’ll be able to help. All the best. Thanks for this guide. It was really handy. However I’ve just gone and was not able to extend my tourist visa. Spent 25rmb on a lousy passport picture and 2 hours queuing. Maybe the rules have changed or maybe the officer I got was having a bad day. Whatever it is, there’s no winning them. We are so sorry to hear that Yvonne. When we went to get ours, they first said “No, you can not”. We told them yes would can, our friends got theirs yesterday. The person sighed and gave us a form to fill out. I don’t know it was in the “too hard” basket but we just pushed it. Did you push it and they still said no? Thanks for all of the great information. I have a multiple entries 10-year Tourist Visa from America… The question I have is- if I want to stay longer than the 60 days for one entry (without leaving the country and coming back) can they extend the one entry? Great pics. I had no idea you could just take pictures of government buildings like that in China. Anyway I am staying with a Chinese friend who is willing to accompany me to building in Shanghai you wrote about. However the home we are staying at isn’t in his name either. It’s owned by extended family outside of Shanghai so proving that the flat isn’t mine and is his won’t be easy either way. Also to clarify I can get a 60 day Visa extension correct? Not 30? My visa allows me 60 day stays. Sorry Tom you will have to check this all with the immigration website. We are not too sure. The visa extension is different for each country. All the best. I’m planning to visit China at the end of this month and I wish to extend my L visa. I’m going to try and extend it in Qidong, this is a city located close to Shanghai, but I can’t seem to find any information if they have a PSB office where I can do that. If anybody has any information about Qidong I will be very grateful. That’s awesome Sami. We have heard in other places you can do this and it takes no time at all to get your visa extension. We have no idea why Shanghai takes 7 – 10 days. Thank you for leaving the information for others. Which passport do you hold? How long an extension did you ask for? How long did you get? How much money did you show in your account? What time does this place open at? It’s not possible to get second tourist visa extension in shanghai. Just went there last week and they were denying everybody. Don’t waste your time. They said no to us first off too. We pursued it and got it. Did you push it or settle for the first answer? Some of the officers there seem to not want to help us when we got our we pushed it and finally got someone to help. There was a form for it and everything went smoothly after that. Do you know if it is possible to change visa type in Shanghai? My student visa runs out in early July, but I want a tourist visa for some travelling – really don’t want the cost + hassle of going down to Hong Kong. Unfortunately, I braught all the documents needed today at PSB in Shanghai (even insurance, bank account record) but they directly rejected my request. I asked what can I do to stay 30 more days, she said “nothing, 60 days is enough for traveling in China” or go talk to the supervisor. She told me also that I could stay if I have relatives in China, but I don’t. Do you think that some friends could help ? Did you manage to get your extension? I am in Guilin right now, just got my passport back from my first visa extension, and it was very easy. I was planning to do my second visa extension in Shanghai, but after seeing your post I may try to do it in a smaller city. I could do an extension in suzhou, not far from Shanghai by train. They were way more friendly and they accepted my request. Hi could you please give me some details on where todo do an extention in Suzhou? How long did it take to get the visa done? Extending visa in Shangai,Bejing,Chengdu,Chonqing etc or in any metropolis in China is something you dont wish to do. My experience is exactly the opposite from the two individuals above. I extended mine twice in small town Leshan,in Sichuan.fairly easy,none of the documents required mentioned above except hand written itinerary for future travel in China,that s it. Cheers Louie. We did mention that we heard things are easier in smaller towns. Enjoy China! Also.my extension was valid starting from date of expiry of previous visa,not the date of application for extension.